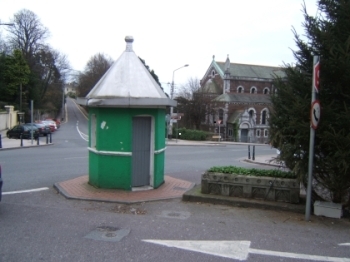 St. lukes cross is the junction of five arteries, these are Wellington road, Middle Glanmire Road, Summer hill road, Ballyhooly road and Mahony's Avenue. The first time it appears on a city map is in the 1832 Holt Map of Cork city. 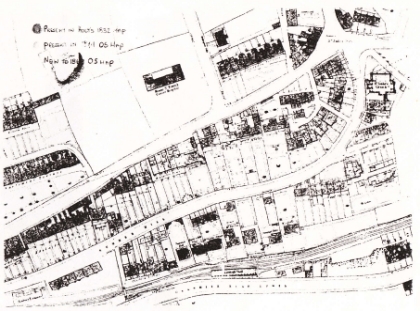 The majority of houses were constructed shortly after the drafting of Holt's Map because the 1841 Ordinance survey map indicates substantial development between Wellington Road and Summerhill road. The church is the principal feature at the cross is St. Luke's church. In the 1830's St. Luke's chapel was erected in the gothic revival style as a chapel of ease to St. Anne's Shandon. Evidence in the 1869 OS map shows that this chapel was quiet different to the existing church. In the 1870's John Benson and William Hill were commissioned to construct a new parish church for the growing congregation in the area. In 1887 the church was burnt and rebuilt. Picture of the toll house in St. Lukes cross. Fragment of 1869 ordnance survey map.